John Hinckley was born on 26 May 1644 at Barnstable, Barnstable Co., MA. He was the son of Samuel Hinckley and Sarah Soole. John Hinckley married Bethia Lathrop, daughter of Thomas Lathrop and Sarah Learned.1 John Hinckley died on 7 December 1709 at Barnstable, Barnstable Co., MA, at age 65. Samuel Hinckley was born on 10 February 1670/71 at Barnstable, Barnstable Co., MA. He was the son of John Hinckley and Bethia Lathrop. Samuel Hinckley married Martha Lathrop. Samuel Hinckley died on 16 August 1751 at Stonington, New London Co., CT, at age 80. Gershom Hinckley was born on 2 April 1682 at Barnstable, Barnstable Co., MA. He was the son of John Hinckley and Bethia Lathrop. Hannah Hinckley was born in May 1673 at Barnstable, Barnstable Co., MA. She was the daughter of John Hinckley and Bethia Lathrop. Martha Lathrop married Samuel Hinckley, son of John Hinckley and Bethia Lathrop. Zerviah Breed married Samuel Hinckley, son of Samuel Hinckley and Martha Lathrop.1 Zerviah Breed was born on 27 August 1706 at Stonington, New London Co., CT. She died on 14 June 1731 at age 24. Julia Gabriela Antialon was born on 6 February 1973 at Lima, Peru. She was the daughter of Juan Luciano Antialon and Julia Celestina Cuyotupa. Julia Gabriela Antialon married Richard Frederick Holcombe, son of Erwin Thaddeus Holcombe and Thelma Frances Kunz, on 12 September 2001 at Ensenada, Baja Caifornia, Mexico. Juan Luciano Antialon married Julia Celestina Cuyotupa. Julia Celestina Cuyotupa married Juan Luciano Antialon. John Erwin Holcombe was born on 1 May 2004 at Walnut Creek, Contra Costa Co, CA. He was the son of Richard Frederick Holcombe and Julia Gabriela Antialon. Marjorie Rose Wright married Richard Frederick Holcombe, son of Erwin Thaddeus Holcombe and Thelma Frances Kunz, on 28 June 1969 at Berkeley, Alameda Co., CA. Marjorie Rose Wright and Richard Frederick Holcombe were divorced on 28 June 1973 at Martinez, CA. Deborah Ann Pedersen married Richard Frederick Holcombe, son of Erwin Thaddeus Holcombe and Thelma Frances Kunz, on 29 August 1976 at Danville, CA. Deborah Ann Pedersen and Richard Frederick Holcombe were divorced on 28 June 1983 at Martinez, CA. Jennifer Noel Holcombe was born on 31 March 1980 at Walnut Creek, Contra Costa Co, CA. She was the daughter of Richard Frederick Holcombe and Deborah Ann Pedersen. Devin Thaddeus Holcombe was born on 22 March 2000 at Walnut Creek, Contra Costa Co, CA. He was the son of Richard Frederick Holcombe Jr. and Teri Cruz. William Clemeth Morey was born on 12 January 1840 at Elton, Cattaraugus Co., NY. He married Melvina Andrews, daughter of Henry L. Andrews and Harriet Holcombe, on 12 March 1865 at Johnsonburg, Wyoming Co., NY. William Clemeth Morey died on 2 December 1912 at Fort Worth, Tarrant Co., TX, at age 72. Minnie Elsie Morey was born on 24 September 1877 at Big Rapids, Mecosta Co., MI. She was the daughter of William Clemeth Morey and Melvina Andrews. Minnie Elsie Morey married Aretus Erastus Freeman on 21 December 1902 at Fort Worth, Tarrant Co., TX. Minnie Elsie Morey died on 17 February 1959 at Seattle, King Co., WA, at age 81. Aretus Erastus Freeman was born on 26 June 1879 at Rutherfordton, Rutherford Co., NC. He married Minnie Elsie Morey, daughter of William Clemeth Morey and Melvina Andrews, on 21 December 1902 at Fort Worth, Tarrant Co., TX. Aretus Erastus Freeman died on 31 December 1946 at Seattle, King Co., WA, at age 67. Iva Melvina Freeman was born on 17 January 1913 at Tacoma, Pierce Co., WA. She was the daughter of Aretus Erastus Freeman and Minnie Elsie Morey. Iva Melvina Freeman married Donald VanHoosier Lawson on 10 September 1932 at Seattle, King Co., WA; at the Freeman home. Iva Melvina Freeman died on 9 July 1991 at Seattle, King Co., WA, at age 78. Donald VanHoosier Lawson was born on 20 December 1908 at Seattle, King Co., WA. He married Iva Melvina Freeman, daughter of Aretus Erastus Freeman and Minnie Elsie Morey, on 10 September 1932 at Seattle, King Co., WA; at the Freeman home. Donald VanHoosier Lawson died on 24 April 1974 at Grants Pass, Josephine Co., OR, at age 65. Mary Addie Morton was born on 8 November 1858 at Brandon, IA. She married Enoch Morrill on 31 December 1879 at Reno, Washoe Co., NV. Mary Addie Morton died in 1946. Teri Cruz married Richard Frederick Holcombe Jr., son of Richard Frederick Holcombe and Marjorie Rose Wright, on 14 June 1997. Child of Teri Cruz and Richard Frederick Holcombe Jr.
Earl Holcombe was born in June 1883 at CO.1 He was the son of William A. Holcombe and Ella McMichael. Francis Erwin Holcombe was born on 16 December 1884 at Silver Plume, Clear Creek Co., CO. He was the son of William A. Holcombe and Ella McMichael. Francis Erwin Holcombe married Mary Ellen Mullarky. Frank and Mary were enumerated in the 1910 Rock run Twp., Stephenson Co., IL, federal census. He was a farmer age 26, she was 27. Mary Ellen Mullarky was born circa 1883. She married Francis Erwin Holcombe, son of William A. Holcombe and Ella McMichael. Gladys Marie Holcombe was born on 26 August 1910 at Rock Run, Stephenson Co., IL. She was the daughter of Francis Erwin Holcombe and Mary Ellen Mullarky. Gladys Marie Holcombe married Lee Henry Weimer. Lee Henry Weimer was born on 3 November 1912 at Rock City, Stephenson Co., IL. He married Gladys Marie Holcombe, daughter of Francis Erwin Holcombe and Mary Ellen Mullarky. Mary C. Loomis was born on 13 July 1816.1,2 She was the daughter of Walter Loomis and Clarissa D. Bush.1 Mary C. Loomis married Charles M. Phelps, son of William Phelps and Abigail Holcombe, on 8 June 1837.2,1 Mary C. Loomis died on 12 June 1912 at age 95. She was buried at Pine Hill Cemetery, Westfield, Hampden Co., MA. [S577] Bush - Dewey Bible. [S137] Elisha Scott Loomis, Joseph Loomis, page 253. Charles M. Phelps was born on 6 February 1813.1 He was the son of William Phelps and Abigail Holcombe.1 Charles M. Phelps married Mary C. Loomis, daughter of Walter Loomis and Clarissa D. Bush, on 8 June 1837.1,2 Charles M. Phelps died on 2 June 1872 at West Indies at age 59.1 He was buried at Pine Hill Cemetery, Westfield, Hampden Co., MA. William Phelps married Abigail Holcombe. Abigail Holcombe married William Phelps. Bennett B. and Mary O. were enumerated in the 1850 Southwick, Hampden Co., MA, federal census. He was a farmer, age 32, she was 33. Children in the household were Martha E. 8, Emily A. 4, Olivia E. 2, and Brother George B. 22. [S137] Elisha Scott Loomis, Joseph Loomis, pages 253, 383. [S137] Elisha Scott Loomis, Joseph Loomis, page 383. Edward and Harriet were enumerated in the 1870 Southwick, Hampden Co., MA, federal census. He was a farmer, age 40, she was 29. Children in the household were Eddie 7, Angie 4, and Charles 2. There was also a nine-month old child, Daniel Carpenter in the household. 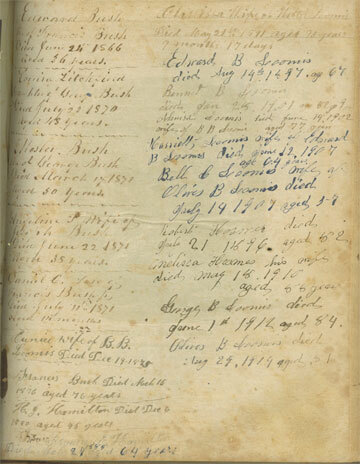 Edward and Herriet were enumerated in the 1880 Southwick, Hampden Co., MA, fedeal census. He was a farmer age 50, she was 38. Children in the household were Edward A. 16, Angeline F. 14, Charles A. 12, Everett P. 10, Freddie W. 4, and Ruth L. 1. Oliver Bush Loomis was born on 23 February 1833.1,2 He was the son of Walter Loomis and Clarissa D. Bush.1 Oliver Bush Loomis married Bell O. Palmer on 17 November 1892 at Westfield, Hampden Co., MA.1,2 Oliver Bush Loomis married Frances Amelia Parsons on 25 August 1908.1 Oliver Bush Loomis died on 29 August 1914 at age 81. He was buried at Pine Hill Cemetery, Westfield, Hampden Co., MA. Oliver and Belle were enumerated in the 1900 Westfield, Hampden Co., NY, federal census. He was 65, she was 49, they had been married 8 years. President Franklin Pierce was related to First Lady Barbara (Pierce) Bush through their closest common ancestor, Stephen Pierce Jr.
[S95] Gary Boyd Roberts, Presidents 1995 Edition, Page 29.